Captain Rivers has always been rather attracted to this little sketch by the German artist Tischbein, dating from 1787 and simply entitled Goethe at a Window. For a start, it humanises the revered and towering figure of European literature. Here, he’s just a lad like any other, gazing out of a window of an inn, apparently in Italy. I like the whole languid feel of it, and wonder what he’s looking at. This sets off a thought. When travelling, I don’t always have time for museum loitering, I’m impatient in queues and sometime there’s just no opportunity to squeeze in another temple or cathedral. But one thing is guaranteed: I always have time for looking out a window. Maybe this is why I like river-cruising so much: out of the window of your cabin, whole countries float past. Window-looking doesn’t always take place for the happiest of reasons. I often travel solo for work, and hotel rooms can make me feel lonely. Perhaps looking out of windows at other people passing by is a way of reminding myself that I’m not really alone. It gives me a feeling of connection even in the most outlandish places: that person walking by with the shopping, talking on a phone or pushing a cart is so ordinary and so universal. 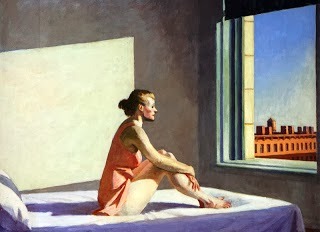 Morning Sun by Edward Hopper, 1952. Of course, there’s part of me that wants to make a connection, another part that doesn’t really want to get involved. 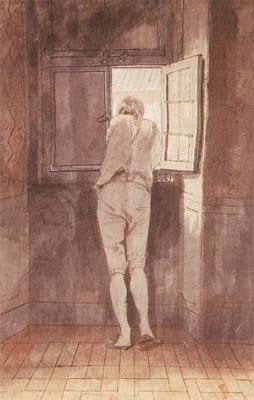 Certainly, looking out of windows has an element of voyeurism that can be sometimes titillating, sometimes confrontational. Anyone who has taken a taxi in India has hesitated over whether to connect with, or ignore, the grimy-faced beggar on the other side of the window. Actually, one of my most memorable window-looking episodes was in the restaurant of the Oberoi hotel in Mumbai. I was reading the Indian Express over buffet breakfast as I tucked into sausages while watching the chef make an omelette at the buffet stand. Then I turned and looked out the window, and directly below, people were sleeping on the pavement on piles of cardboard. Sitting at the window of a cabin on APT's Amabella. But looking out of windows is, for the most part, one of life’s great pleasures. It provides simple glimpses of beauty that make me pause amid life’s busyness. “The late afternoon sky bloomed in the window for a moment like the blue honey of the Mediterranean,” writes F. Scott Fitzgerald in a fine sentence from The Great Gatsby. Who hasn’t experienced a wonderful moment like that when peering out of a cruise-ship window? If you’re keen on looking out of windows yourself and have something to add, I’d be interested. Please leave a comment and join the conversation! I'm with you. Looking out of windows in unfamiliar places is one of my favourite things. Watching the passing parade, whether it be people, vehicles or scenery, means you you can just slow down, observe and lose yourself in thoughts about the different world outside. And appreciate some of the finer detail of what is going on out there. Thanks for your response, it's great getting feedback on River Cruise Insight. Glad the Captain's musings on looking out of windows has struck a chord with you.